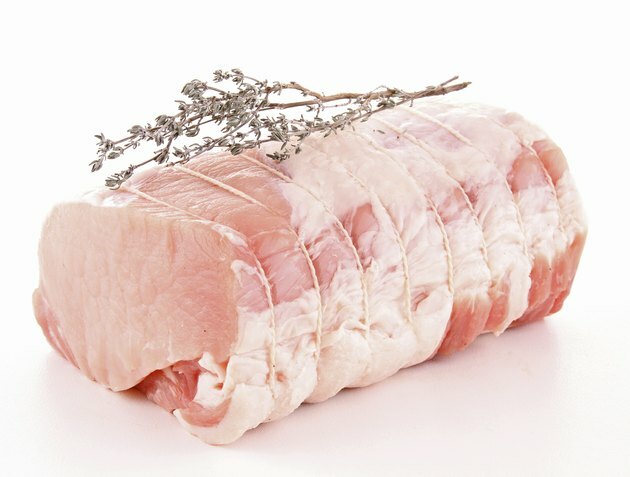 Pork sirloin roast is an excellent alternative to traditional beef roasts for health-conscious home cooks: For every 3-oz. serving, pork sirloin contains fewer calories and less saturated fat than lean beef roasts such as beef tenderloin. Pork sirloin is rich in vitamins and minerals such as thiamin, phosphorus, riboflavin, niacin and vitamin B6, is simple to prepare -- its total cooking time is less than two hours, with little supervision -- and can be paired with a wide variety of side dishes, from grains to vegetables. Cut the kitchen twine into a series of segments that can each easily wrap around the roast. Starting 1 1/2 inches from the end of the roast, tie a piece of twine around the meat; it should be snug, but not too tight. Tie twine around the roast every 1 1/2 inches down the length of the roast. Cover the roast loosely with plastic wrap and let it stand at room temperature for up to one hour. Preheat the oven to 375 degrees, with the rack adjusted to the middle position, near the end of the rest time. Dry the roast with the paper towels, then sprinkle it generously with salt and pepper. Heat the tablespoon of oil in the skillet until it just begins to smoke. Add the pork sirloin roast and brown it on all sides. Place it in the baking dish. Roast the pork in the oven for approximately 50 to 70 minutes, turning the pork over in the pan after about 35 minutes of the cooking time has elapsed. Remove the roast from the oven when the instant-read meat thermometer registers between 145 and 150 degrees in the thickest portion of the meat. Put the roast on a cutting board, tent with aluminum foil and allow to rest, undisturbed, for 15 to 20 minutes. Cut off the twine, slice and serve. Alter the flavor of your pork sirloin roast by rubbing the meat with different herbs and spices before browning. You can also baste the roast during its time in the oven with stock or wine every 15 minutes for additional flavor. Cooking pork longer isn't better -- you'll only end up with tough, grayish meat. Remove the meat from the oven when it reaches a minimum of 145 degrees, and don't skip the aluminum tent or resting time because this ensures that the meat will reach just the right doneness.